Well, well, swell. 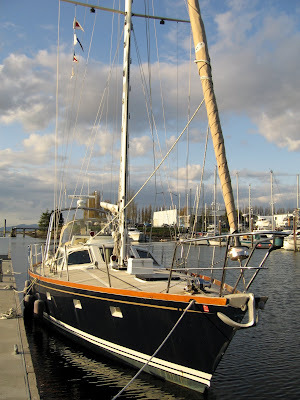 At long last I have set sail aboard the s/v Nomadness in search of my strange new life and live new strangers and new reasons to laugh in spite of the terror of the situation. My able and brilliant partner, Steve Roberts, has provided the substrate for our journey in the form of an 18 ton raised pilothouse steel sailboat. I abandoned my land based life of librarianship about six months ago and took the plunge into what I've come to know as the technomadic lifestyle. It is true what they say about having to let go of something to be ready to grasp the next opportunity. Ask a trapeze artist, they'll tell you. This space will be used to log my inner and outer journey, share our experiences through words and pictures, and allow friends and family to track our geographical journey. For those who know me, the choice of title for this blog will seem natural, I have a flair for the dramatic having spent years doing avant garde theatre and running a performance space. A couple years ago I discovered sailing and something very deep and long asleep awoke and demanded attention. "Take to the water" the voice whispered. I thought it over. I love to travel but hate cars and planes; I love being in nature, but need socializing. I love solitude but despise routine. Ahh... the cruising life suits me well. And for the first time in my life, I will have the time and space to write. Not to mention an endless flotsam and jetsam of material and colorful characters to people my stories and ignite the imagination. Yay! I miss you. Looking forward to staying abreast of your many adventures! Hello, fellow (former) librarian. (It does attract people who are interested in Everything, doesn't it?) I knew Steve slightly in high school, and knew he would have an interesting life. how exciting! and how is your dog faring on the water? Hope it's everything you imagined and more. We miss you in Shel-town. The Great Dane and Other Salty Dogs!